Recently, the United States Supreme Court heard oral arguments in Troxel v. Granville, No. 99-138 (argued Jan. 12, 2000), involving the issue of grandparent visitation. While it remains unclear whether the Court’s opinion will have any significant impact in Wisconsin, the case involves issues of basic and significant societal concerns. These issues include the very definition of family and the extent that government should be allowed to interfere in the lives of families, absent compelling circumstances for such intervention. Brad Troxel and Tommie Granville are the never-married parents of two daughters. After they separated, Brad lived with his parents and the girls visited at their paternal grandparents’ home. In May 1993, Brad committed suicide. Initially, Tommie allowed the girls to continue to visit their grandparents, but soon Tommie started limiting the visits. In December 1993, the Troxel grandparents filed a petition under Washington state law seeking to secure visitation rights.The trial court granted the petition, allowing one weekend per month, one week during the summer and some time on each of the grandparents’ birthdays. Tommie appealed. While the case was on appeal, Tommie married and her husband adopted the girls, establishing an intact family. The Washington statute which the Troxels sought to invoke allows “any person” to petition for visitation rights “at any time” and allowed the court to order visitation rights when “visitation may serve the best interest of the child.”Wash. Rev. Code§ 26.10.160(3)(formerly § 26.09.240). The Washington statutes make no attempt to restrict the class of persons who may seek visitation, nor does it provide any factors beyond “best interests” to allow a court to assess whether visitation should be ordered. The family entity is the core element upon which modern civilization is founded. 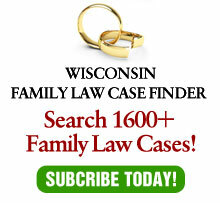 Traditionally, the integrity of the family unit has been zealously guarded by the courts. The safeguarding of familial bonds is an innate concomitant of the protective status accorded the family as a societal institution….Where a fundamental right is involved, state interference is justified only if the state can show that it has a compelling interest and such interference is narrowly drawn to meet only the compelling state interest involved. at 28. The court found that the instant case did not present a compelling state interest. Lack of visitation with their grandparents, the court found, would not harm the children. State intervention to better a child’s quality of life through third party visitation is not justified where the child’s circumstances are otherwise satisfactory. To suggest otherwise would be the logical equivalent to asserting that the state has the authority to break up stable families and re distribute its infant population to provide each child with the ‘best family’. It is not within the province of the state to make significant decisions concerning the custody of children merely because it could make a ‘better’ decision. Two compelling, yet competing, concerns are at stake in this case.The first is sympathy for the grandparents who must first deal with the loss of their son and then have that loss compounded by losing their grandchildren.There are no facts in the Washington court decision which indicate that the grandparents did anything inappropriate.Together with compassion for the grandparents is the recognition of loss by the children, for whom a relationship with an extended family can be a richly rewarding experience. Second, there is a competing concern for the fundamental belief that, absent compelling circumstances such as child abuse or neglect, intact families should be entitled to control their own destiny without the “Big Brother” of government controlling their lives.Requiring extended-family visitation can be extremely disruptive to the family. For example, to the extent that families plan activities around weekend free time, requiring the children to visit their grandparents instead can cause significant disruption. By not restricting the list of potential visitation seekers, the Washington statute under consideration by the court is highly problematic.The potential list is long. A child may have significant relationships with aunts, uncles, cousins, day-care providers, teachers, neighbors and countless others.The potential for litigation is mind-boggling, not to mention that there are only a limited number of weekends available. Whether the grandparent has maintained a relationship with the child or has attempted to maintain a relationship with the child but has been prevented from doing so by a parent who has legal custody of the child. Whether the grandparent is likely to act in a manner that is contrary to decisions that are made by a parent who has legal custody of the child and that are related to the child’s physical, emotional, educational or spiritual welfare. Whether visitation with the grandparent is in the best interest of the child. Additionally, it should be noted that the Supreme Court of Wisconsin has recognized, in the presence of extraordinary limited circumstances, the existence of the trial court’s equitable powers to grant third-party visitation, even when a person lacks standing under Wis. Stat. § 767.245. See Holtzman v. Knott, 193 Wis. 2d 649, 533 N.W.2d 419 (1995). It is possible that the Court could merely uphold the finding that the Washington statute is unconstitutional, without direction as to which elements would sustain such a statute. On the other hand, if the Supreme Court reverses, virtually any visitation statute, no matter how broad, could pass constitutional muster. Hopefully, the decision will do neither of these, but instead, provide some guidance of how to walk the narrow tightrope between a child’s right to have a relationship with adults with whom the child has an established relationship and the right of parents to maintain control over their own families without undue government interference. Editor’s Note: Gregg Herman immediate past president of the Wisconsin Chapter of the American Academy of Matrimonial Lawyers. He serves on the Academy Committee on the Special Concerns of Children, which assisted in drafting the amicus curiae brief in Troxel.